At the end of the day, I am often amazed at how quickly time has flown by. The hours between breakfast and dinner seem to zoom past in the blink of an eye. Since time passes so quickly, homeschool moms have to make good use of their time. If you, like me, are striving to use time in the most efficient manner possible, consider these time management tips for homeschool moms. Get organized. It’s hard to accomplish our homeschool goals in an efficient manner if we’re trying to work in a cluttered and disorganized space. Precious time is wasted when we have to search for teaching materials and supplies or if we have to clear away clutter in order to create work spaces. An organized homeschool space is necessary if we want to make the most of our time. Limit distractions. Technology and people (even those we love) can gobble up precious time during the homeschool day. A twenty-five minute phone conversation, an hour long internet surfing session, and a twenty minute chat with a neighbor can swallow up nearly two hours of valuable teaching time each day! Limit distractions by telling callers you’ll contact them later or by letting the voicemail do its job. Knock out technological distractions by turning off phone notifications or by waiting to check up on social media accounts during the day’s down time. Have children help out. In addition to homeschool duties, we have household chores to complete. Dishes need to be washed, laundry needs to be done, floors must be swept, and meals must be prepared. We can lighten our loads by having our children take on some of the household responsibilities. When taught how to do so, children can wash dishes, fold laundry, sweep floors, and even cook. Prioritize. Prioritizing can help us determine which subjects should be completed first and which subjects can wait until later. In our home, Bible study, math, and language arts are always our first educational priorities. If something pops up later and takes us away from schooling (an unexpected doctor’s appointment, a traffic jam on the way to or from lessons, etc), I don’t get upset because I know we’ve already completed the most important subjects. Think about what’s most important in your homeschool and make those activities and subjects the day’s top priorities. Create a reasonable schedule. 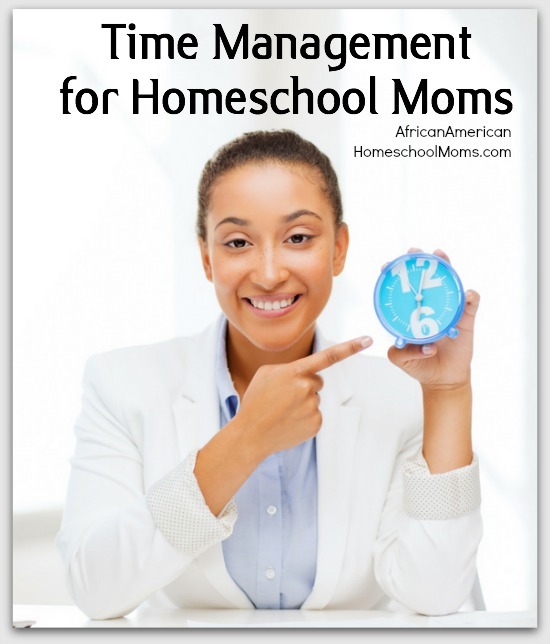 A schedule can help homeschool moms manage time as well. Follow a loose schedule (math in the morning, science in the afternoon) or a more structured schedule (math: 9:30-10:15, science: noon-1:00, etc). Determine what works for your family and work from that schedule. The goal is to have a schedule that helps create a productive, purposeful, and pleasant day. Use a calendar. Whenever I try to keep track of things using my mental calendar, I always forget to do something. Forgetfulness results in wasted time because later on I have to back track and take care of the issues that slipped my mind. We can set our minds at ease by keeping track of appointments and activities using a calendar. Whether you use a digital calendar or an old fashioned pen and paper planner like me, commit to using something to help you keep track of times and dates. Summer is the perfect time to think about time management techniques. While we’re relaxing on the beach or riding in the car during the family day trip, we can ponder ways to implement time saving tips throughout the school year. The time saving seeds we sow now will yield a harvest of blessings when the busy school year begins in just a few short months!